one of these DARLING book marks! Oh, I just LOVE them! Become a follower of her blog for an extra entry (just let me know that you did/are). Click here to see the rest of her amazing creations. See something you like in her Etsy shop? - Enter "justsew" in the discount code for an extra 10% off (until Sunday). I'm getting some for my kids' teachers Christmas presents (like the one below) and maybe for a few other people that I can't mention because they might be reading this... Oh, and there's free shipping on everything right now, so hop on over and check them out! And, if you haven't entered to win the PURE Layer Cake and my 3 latest patterns click HERE. I'll announce all of the winners next week. 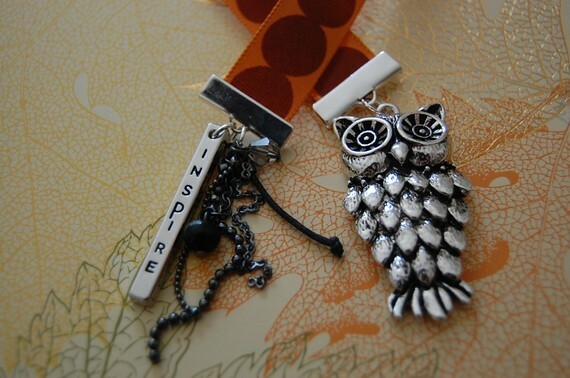 Very cool book marks. I agree with you too, the tape measure ribbon is perfect. Oh my! That is truly darling! Well.. I think that would look fantastic in a quilting book! 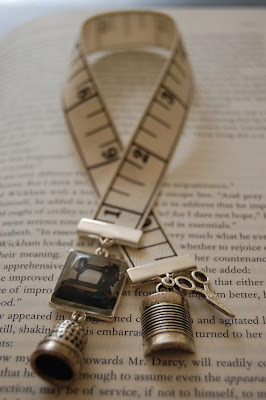 Love this gorgeous bookmark with the measuring tape! Please enter me into the give away!! I love the tape measure book mark!! I became a follower of Cassie's blog....which is amazing by the way!! Love her etsy creations!! This English teacher and quilter would absolutely LOVE to win! thanks! I see creativity runs in the family! How cute! I would love something like that. Cassie's blog looks great! That would be my first choice too. It is adorable. ooh yes I love the tape measure ribbon! I am also a follower of A Serenade for Solitude. Love this bookmark with the measuring tape!!!! I just went to visit Cassie. What a great blog! Thanks for introducing her - I am now following A Serenade for Solitude. What a unique, fun, bookmark....you have a very talented family. Thanks for the opportunity!! These are so cute. I love them! What a fun idea. I follow her blog with gfc (psychdog). I love your sister's bookmarks! 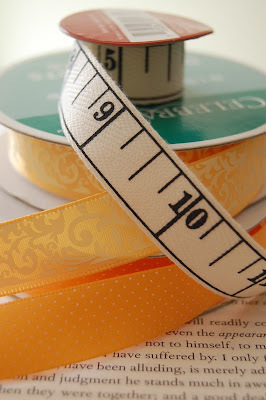 I agree that the measuring tape ribbon is adorable. Thanks for a chance at your giveaway! Well, the bookmark is just the cutest! I'm a reader for sure, as I'm a teacher, but also, a new quilter. Thanks for the opportunity to win. I seriously love Cassie's bookmarks. I would love to win one. And I'm excited for the discount...they're perfect for teacher gifts! Thanks for the great idea! Love the bookmarks, what a talented sister. Once again, I'm in if you let me ! This is something new! I have not seen these! Thanks for the chance to win one. I really like these! Very pretty! Oh for goodness sake, those are so cute! This would be perfect for my sister. Thanks for the chance to win. I follow her blog via GFC. What a creative design for a bookmark. Thanks for a chance to win. I agree also - the tape measure ribbon is very cute. Please I would like to be in you giveaway. Oh my, that is sooo adorable. Would love to win! Thanks for the chance. I'm off to check out her shop. I'm a follower now... I follow you everyday!!! I love your blog - and I LOVE those bookmarks! Oooh, those bookmarks are cute as can be!!! So very cute! Quilting and reading - 2 of my most favorite things. What a sweet bookmark! I love all of them in the Etsy shop - will be going back there for birthday gifts soon. You are two talented sisters! Also, I'm a follower of your blog. Thanks! Wow. Really cute and clever. I would "sew" love to have a sewing bookmark!